They say change is good…. 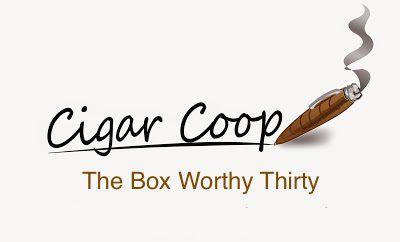 and this year big changes are coming to the 2015 Cigar Coop Cigar of the Year Countdown. The countdown originated back in 2010 and the concept involves ranking the Top 30 Cigars over the past year. For 30 days throughout December, we countdown from 30 – all the way to one. We reveal one cigar per day (except for the final day when we announce the top two). While we weren’t the first the rate the top cigars for the year, we believe we were the first media outlet to implement it in a daily countdown. While the countdown concept may seem overkill, it gives a us a way to look back and reflect on some of the best things the cigar industry had to offer. The original idea of the countdown was to use a concept called “Epic Encounters” – namely what was the best cigar we could uncover. We would also rate the line (which we consider as having a common blend with common branding) as a whole. As we have evolved, we have discovered there a need to evolve and adjust the countdown, thus we are making some major changes to the model going forward. This list stands alone within the Cigar Coop and Stogie Geeks brands – and we do not endorse or support any composite or consensus lists without explicitly our brands stating so (we do support the Cigar Media Association Awards, but this list is independent of that because of different criteria). If our lists are used without our public endorsement, they are being done without our blessing and do not have our support. Vitola Approach: We now will no longer rate the line as a whole. Our philosophy over the past year on Cigar Coop and Stogie Geeks has been size matters when assessing a cigar, therefore are now treating each vitola separately. We now will select the best vitola from the line, and the ranking will be based on the vitola and not the line as a whole. Only one vitola per line will be eligible for the Countdown. New Vitolas of Blends from Previous Years Now Eligible: It used to be that line extensions were considered previous “lines” and not eligible. This is no longer the case. If a line releases a new vitola, it is treated as a new cigar, therefore it is eligible. With this change, we will no longer have a “Best New Vitola” list. No More Shop or Regional Exclusives: Shop Exclusives are no longer eligible for the Countdown. In addition Regional releases and group-restricted releases (i.e. TAA, etc) are no longer eligible. Limited Editions, but not Ultra Limited Editions: We are not eliminating limited edition or limited production cigars. Limited Editions not constrained by geography, shop, or group of shops are still eligible. Box Worthy: All cigars included on this year’s countdown must have an Assessment Rating of “4.0” – i.e. Box Worthy. Because of the changes to the criteria, it is in the best interest of retiring the “Epic Encounters” concept. It will now be replaced by the “Box Worthy Thirty” concept. Releases That Qualify: Any cigar considered a new release – whether it is an new line (featuring a new blend) or a new vitola (from an existing blend) will qualify. Blends returning to the marketplace are not eligible. Exclusions: Shop Exclusives, Regional Exclusives, Event Cigars, Lounge Cigars, or cigars constrained to an organization or media outlet. Cuban Cigars are excluded, since they are not readily available in the U.S. Minimum Criteria: All Cigars must have a minimum numerical score of 92 (same as last year) and an Assessment Rating of “4.0 – Box Worthy”. Scores and Assessment Ratings are thrown out the window here. Every cigar starts with a clean slate. .
Ethics: All inclusions are based strictly on merit. There are also no guarantees for sponsored cigars to make this list. Intangibles: The list isn’t purely based on score or assessment rating. While it’s not the final arbitrator, we also looked at the impact the cigar made on the market. How does the Countdown Work? Each day in the month of December we will count down a cigar. We start with #30 on December 1st, and continue with one cigar a day. On December 25th and December 30th, we will not have a countdown selection (although you will still have original content from Cigar Coop on those days). On December 31st, the #1 and #2 Cigars will be crowned. Glad to see you implementing change number 2. It definitely goes along with your current theme of “size matters” and I’ve always felt those were new cigars even though they came from a previously released blend. Aaron, thanks so much. The original concept was to assess the line as a whole, but this proved to be way too much with all of the cigars we were reviewing. Thus, it became impractical The “size matters” theme really hit home for us in recent months as we saw so many lines with many nuances from vitola to vitola. This was something we really were missing out on. I absolutely love the countdown Coop…I cant take in a whole “Top 20” list (or even half of one) in one sitting…I like it spread out. The only thing I’m not a huge fan of about the new changes are 3 and 4, some of the best cigars released this year fall into those two criteria (not to mention my favorite cigar released this year was a TAA). Anyways…look forward to the count down Coop! Charlie, thank you as always for your feedback and support. It was a tough decision, and you are right – there were some great cigars released under #3 and #4. Thank you for the 2015 Cigar Coop of the Year list. Your “new” process of evaluation is great. It’s also informative for new members to the cigar world like me.